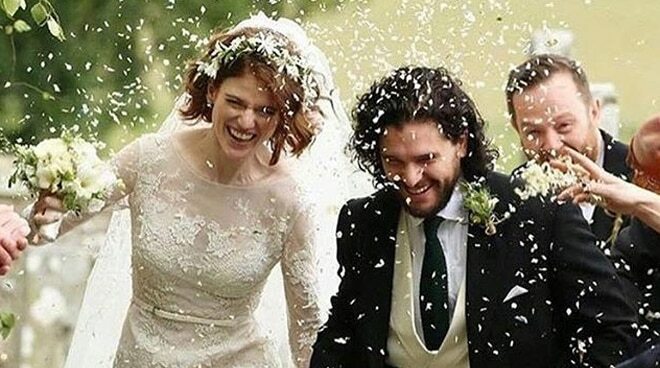 Nine months after getting engaged, Games of Thrones actors Kit Harington and Rose Leslie tied the knot in the latter's hometown in Scotland. In a report by US Weekly, the onscreen-turned- real life couple, who met on the set of the said hit TV show, exchanged their wedding vows at Rayne Church in Kirkton of Rayne, Aberdeenshire in Scotland. Fellow Game of Thrones stars Peter Dinklage, Sophie Turner, Maisie Williams, and Emilia Clarke also attended the event. Harington and Leslie, who play Jon Snow and Ygritte in the famous TV show, met on the set of GoT over six years ago.